The final 3 makkot, and the leaving of Mitzrayim. Also the first mitzvah given to the Jewish people, and what is sometimes called "the most important Ramban in the Torah"
Tefillah Lessons from the Exodus from Egypt #4 : The Importance of "Setting" for Tefillah; The Posture of "Outstretched Arms"
Did Pharoah Have Free Will? Should You Always Run After Mitzvos? Welcome to the new landing pages for categories on YUTorah. To see all the shiurim, that belong to this topic, click on the "SEE ALL SHIURIM" link. Click here and type anything you want to search within the shiurim of this topic. featured (the shiurim hand-selected by our editors that we think you will enjoy),and all the available series and categories within this topic's shiurim. 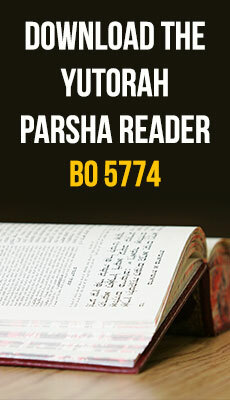 You can filter the shiurim by text/audio, length, upload date or language. Click here to see the certain lecture within your topic. Click here to see some more lectures within your topic. Never miss a new shiur from your favorite topic, by subscribing to an alert for new shiurim, either by rss, through a podcast, or an email. Some specific collections of the shiurim and banner area within your topic.